The Casanova/Oak Knoll neighborhood of Monterey is home to the Cypress Park condominium complex situated on Casanova Avenue. The area also consists of single family homes which are primarily single level, ranch style homes built in the early 1950’s. Nestled east of the Monterey Pines Golf Course and directly north of the airport, this neighborhood is bordered by Fremont Street to the north, Casanova Avenue to the east, and Airport Road to the south. 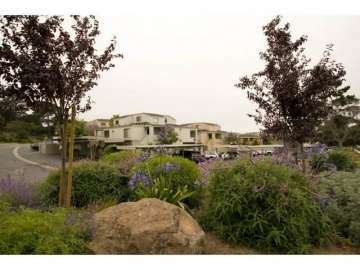 It is an accessible and centrally located neighborhood with the Monterey Regional Airport conveniently close as well as quick access to Hwy 1. Work Memorial Park in bordering Del Rey Oaks is walking distance from the neighborhood, as well as the neighborhood’s own park, Casanova Oak Knoll Park. This charming park is a sunny retreat for relaxation and boasts a Preschool, “Stay N’ Play” and Teen Drop-In programs and recreation including interactive games and Internet access. This 1.3 acre park also has a basketball court, newly renovated group BBQ area, outdoor patio and large grassy area. Another great feature of Casanova/Oak Knoll is its location in the sunbelt of Monterey where you will enjoy sunny, fog free days with pleasant temperatures and blue skies. Of course if you are craving the sea breezes, the beach is just a 5 minute drive away. Homes in Casanova/Oak Knoll can range in price from $549,000 for a 4 bedroom 2 bathroom single family home with 2,075 SqFt of living space, to $230,000 for a 1 bedroom 1 bath condo unit with 598 SqFt of living space. Click here to view all homes for sale in the Casanova/Oak Knoll neighborhood. For all available Monterey real estate, click here. There were 14 homes that sold in this neighborhood in 2014. The most expensive home sold for $633,000 and was a 1809 SqFt home with 3 bedrooms, 2 bathrooms situated on 5,900 SqFt of land. The least expensive home sold in the neighborhood was sold for $201,000 and featured 1 bedroom and 1 bathroom with 517 SqFt of living space. In 2013, the most expensive home sold in the neighborhood was a 3 bed, 2 bath country style home with 1,568 SqFt of living space situated on 6,000 SqFt of land, which sold for $525,000. The least expensive home sold was a 1 bed, 1 bath condo in Cypress Park, which sold for $90,000. In 2012 there were 33 home sales in the neighborhood of Casanova/Oak Knoll. The most expensive home in the neighborhood sold for $487,000 and was a 4 bedroom 3 bath home with 1,954 SqFt of living space situated on an 8,352 SqFt lot. The least expensive sale was a condo in Cypress Park with 2 bedrooms and 1 bath that sold for $117,500. This unit had 850 SqFt of interior living space. For a detailed analysis of Monterey real estate, check out our monthly Community Market Report. To live in Casanova/Oak Knoll is to live in an affordable community offering value in the Monterey area. For those who wish to have a smaller carbon footprint or simply do not desire nor require single family dwellings, the condos here offer a great alternative. The affordable Cypress Park Condos offer 1 or 2 bedroom units with complex amenities including a swimming pool, spacious master suites, and a clubhouse. They are a great home base for access to all the best the Monterey Peninsula has to offer. For families, living here also offers value as well as a community feel with parks to play in and resources for children. You will appreciate your ability to easily drive, even walk to the shore where you can enjoy recreation and relaxation along the sparkling Monterey Bay. There is an abundance of sports to partake in from cycling to scuba and endless miles of recreational trail to explore. The Monterey Peninsula always has an event going on, from golfing events at nearby Pebble Beach to festivals and parades in “America’s Last Hometown” of Pacific Grove, your calendar will be full with exciting and colorful engagements. Less than a 10 minute drive away you will treasure visits to Cannery Row with its vibrant street of shops, restaurants and amusements, the gem of which is the world renowned Monterey Bay Aquarium. It is also noteworthy to mention that golfers will particularly love this neighborhood as it is bordered by Monterey Pines Golf Course, with Del Monte Golf Course just miles away as well. What a fun neighborhood to call home in one of the most unique and beautiful cities one can imagine.